If you haven't read Part 1: Want To Be Healthy? Don't Eat These 7 Toxic Fish - you can find it HERE. It will give you important health information of which fish have toxic levels of mercury and which are safe to eat. You have a mouthful of mercury. Should you worry? What About All That Mercury In Your Mouth? After reading Part 1, we know we don't want a mouthful of toxic mercury as in eating too many mouthfuls of toxic fish. But, what about that mouthful of mercury you carry around with you 24 hours a day? Are you a walking toxic dump? Are your children? The answer is a controversial one. But, according to the watchdogs and experts, the current answer is - NO. You don't need to worry about the mercury in your dental work. But if mercury is a toxic heavy metal, then why don't you need to run out and get your fillings yanked out asap? Why is Mercury the Element of Choice for Dentists? Dental fillings, called amalgam, is made of a mixture of metals. It combines mercury, silver, tin, and copper. Approximately half of that mixture is mercury. Dental amalgam is often called “silver fillings” because of the color. But there is none of the metal, silver, present. The amalgam mix is strong. It starts off soft enough to mold into that tiny hole your dentist drilled out where a cavity formed. Then, the mixture hardens into a solid that can remain in place for years - if not an entire lifetime. That’s Superman strong considering as much as we use and abuse our teeth on a daily basis. You had to grit your teeth when your child told you he was dropping out of college. You clenched your jaw, tight, all night long worrying about that meeting with your boss. Why Not Use Other Types Of Fillers? In addition to strength and endurance, amalgam is less problematic. The mercury mix is not as likely to chip, break or shatter as opposed to other types of fillings that were tried. It's less costly for dentists to use, and, thus, better for your dental bill. Plus, because of that staying power, you’re less likely to need to replace an amalgam filling. Isn't dental work expensive enough already? Other fillers, used in recent times, are made of gold, plastic, porcelain, cement, and glass cement materials. Fillings made from a composite resin or glass ionomer can be formulated in a more, pleasing, believable tooth color. These are great for a cosmetic look when placed in the most visible teeth in your smile. BU, most of these newer formulations are more expensive and not as hardy as the amalgam material containing some mercury. They’re more expensive the first time they’re applied and more expensive overall because they must be replaced more often. The strongest filler, other than amalgam, is porcelain ceramic which lasts an average of 7 years. But it can chip easily and take a couple of visits to apply. Traditional amalgam lasts 10 years or greater. Cast gold is, actually, THE most durable material of all. It can exist in a filling for 15 years. Gold, of course, is showy and very expensive. "Smile for me daddy"
But, wouldn't you pay more money, within your means - if it meant your safety and that of your children? Of course! That is if there was a usable, safer alternative to mercury amalgam. At the end of this post, you will find some links to help you feel comfortable in your dental decision making. Mercury has no nutritional benefits whatsoever. So, with mercury in our fillings plus all this abuse we put our teeth through - are we munching on mercury? In days gone by, no one knew mercury was a poison. When I was a child, the main exposure to mercury came from handling or swallowing mercury from a broken thermometer. Or, maybe from swallowing Mercurochrome, aka Monkey Blood, the antiseptic we used on cuts. Which, by the way, is non-existent but not banned. Perhaps that'll be a topic for another post in this series. Today, the greatest source of mercury exposure, in the U.S., comes from eating fish. The fish absorb mercury from air pollution that falls into the world's waterways, primarily, from coal burning plants. We eat the fish and absorb their mercury. It doesn't hurt the fish but it's toxic for us. Especially young children, pregnant women, the elderly or those with compromised immune systems. You can read more about the mercury in fish HERE. You don't see mercury, do you? That's because mercury is a hazard, not a nutrient. It's a neurotoxin because of it's detrimental effect on the brain and nervous system. It also is damaging to the kidneys. The signs of neurotoxicity are dizziness, numbness, muscle weakness and tremors. These symptoms, usually, don't begin until your mercury level is dangerously high. A person may not know they've been exposed to high levels of mercury without a specific blood test. But, it's a test not routinely ordered in the usual blood work done for a physical exam or doctor's check-up. Unless that blood work is requested or symptoms indicate the need for tests, high mercury deposits in the human body can go undiscovered indefinitely. Does Mercury Drive You Mad? 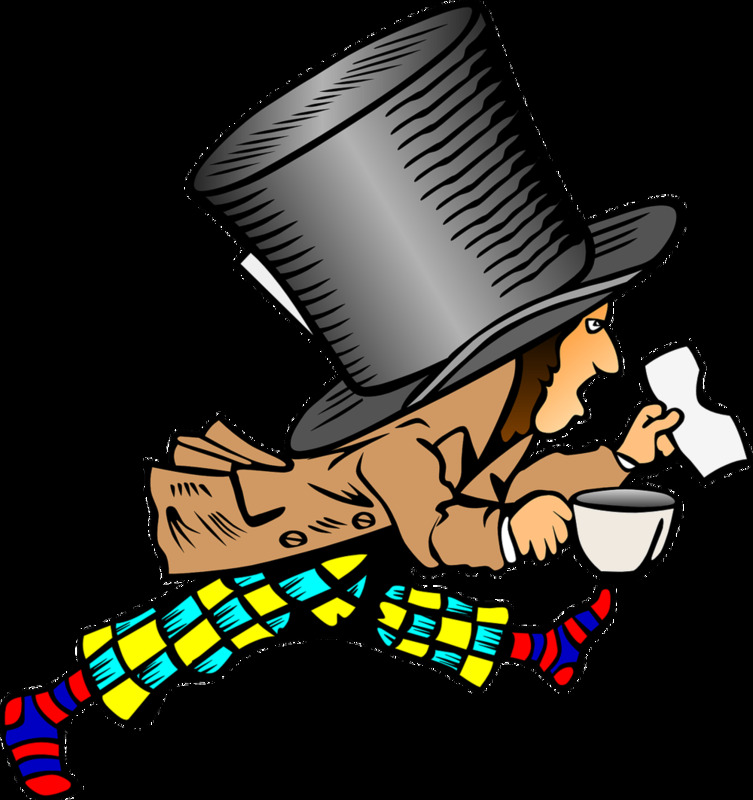 An old term, used for mercury toxicity, was Mad Hatter Syndrome. The Hatter in Lewis Carroll's book "Alice in Wonderland" became known as the “mad hatter” because he behaved as “mad as a hatter”. Why was The Hatter Mad? In the 1800s, members of the hat making profession used a mercury solution to turn fur into felt. Due to poor ventilation in factories and workshops, the hatters inhaled dangerous fumes, all day, making hats. As a result, they developed toxicity from the constant mercury vapors. At that time, no one knew why the hat-makers developed the “hatters shakes”, memory loss, uncoordinated movement and slurred speech. Too many pints of ale at Ye Ol' Pub? Now, we know they were exhibiting symptoms of high levels of systemic mercury, not mental illness, or as it was referred to then... madness. What makes the hatter mad? Mercury! In today's world, it's hard to go through life eating fish and breathing industrial air without absorbing traces of mercury into your body. Almost everyone has a little. Most of us walk around living with a low level of mercury. Usually, the amount isn't enough to cause health problems. But what happens when we add mercury fillings to the daily onslaught of, avoidable and unavoidable, mercury all around us? It's a fact - fillings release tiny amounts of mercury vapor. You could say that you are breathing it in. It's similar to breathing city air. Our earth's air and waterway contain mercury, primarily, from the world's coal burning plants. The Federal Drug Administration monitors important public health research. They oversee the use of mercury used in dentistry to ensure low levels of inhaled mercury from amalgam is not dangerous to U.S. citizens. The FDA states that the best studies do not show a relationship between the mercury in dental fillings and any health issues. You can read the FDA's position HERE. Who's at Greatest Risk from Exposure to Mercury? Those at greatest risk are children, under age 6, and unborn fetuses. These two populations, because their bodies are still growing, are at more risk than the rest of us. Specifically, its because their nervous systems are still in development. Toxic mercury can wreak havoc on their still forming brains and nerves. You can read the ADA's statement on amalgam fillings HERE. The FDA will continue to be the U. S. watchdog - monitoring research and the use of dental amalgam containing mercury. At LIVING BETTER by laura we, too, constantly review medical research and the FDA site. Subscribe or stay in touch to get the latest updates if any new research is published or changes in the FDA's opinion occurs. Read Part 1: Want To Be Healthy? Don't Eat These Seven Toxic Fish to learn which fish have the highest levels of mercury HERE. For more information on eating healthy you can read about nutrition myths HERE. If you think this information on dental mercury could be helpful or interesting to others, please share on social media. We would love to hear from you. What are your thoughts about the mercury in dental fillings? Let us hear about it in the Comment Section below. Get the absolute latest health and lifestyle information - sign up for our newsletter TIPS FOR LIVING BETTER by laura using the form below. Don't wait for the post, get the important scoop before the rest of the world!